As we’ve discussed many times before, Radon is a very real problem in many areas of the country. Today we want to delve in and look at our very own Kendall County, IL and learn about the current radon information made available to us and why this should be important to you and your family. We have all agreed that Radon is a known Class “A” carcinogen and may lead to harmful health effects such as Lung Cancer. What becomes important is to have up to date information about your county and what to do about it if you should find that there is a problem in your home. 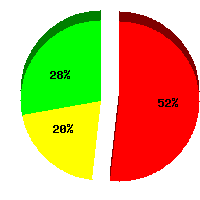 The chart above demonstrates in the red section, that 52% of the homes within Kendall County have tested at 4.0 pci/l or higher, 20% of the homes read between 2.0 pci/l and 3.9 pci/l (yellow section) and lastly, 28% of the homes tested under 2.0 pci/l. For the average homeowner that is not under a real estate contract, most independent sources such as the EPA will advise mitigating your home if your reading falls within 2.0 – 3.9 pci/l. Remember, the lower your radon levels are, the lower your exposure and ideally your risk. **All of the radon information produced by state, local and national government assume a 70% exposure rate. That means, that you are in your home 70% of the time between sleeping, just being at home, weekends etc. Is the contractor licensed? You can find an Illinois state licensed contractor on the Illinois Emergency Management Agency (IEMA) website. Are they insured? Radon mitigation systems sometimes require alterations to your home. Make sure that the contractor’s insurance is up to date and they have the proper coverage for the scope of work. Did you receive a written proposal and/or estimate before proceeding? You should always be given a scope of work, breakdown of pricing and any limitations or exclusions that may apply? Did they provide a guarantee of their work? A qualified installer should be able to get to the root of your problem and address the issue at hand as well as have the confidence that the system will be functional and mitigated to the lowest levels achievable for your home. Do they have references or reviews?? Be sure and do your homework! **Are they experienced in what you need them to do?? This is a big one. Don’t fall for companies that will promote how long they’ve been in business or are a jack of all trades and master of none. The pertinent question is – how long have they been Radon professionals?? Do your homework. Although everyone needs to start somewhere, don’t get fooled with salesman talk. Ask to see their license and know how to read it. For instance, my license number is: RNM2008209. That means, I have a Radon Mitigation Professional license, was licensed in the year 2008, and was the 9th person that year to be licensed. How many installations have they performed? They should willingly provide this information to you and it can be validated with the Freedom of Information Act. Have they pulled the appropriate permits to do the job? Radon Mitigation is not a “side job” kind of business. Any reputable contractor will have the appropriate permits for your install. If you are unsure if a permit is needed, call your local Village Hall to find out. Lastly, don’t make your decision on price alone. A lower price may indicate lower quality materials being used, underpaid or unlicensed technicians working on your job and an overall lack of craftsmanship. Arming yourself with the right information and being a saavy consumer will put you in the lead. Don’t get caught by surprise. Please be sure and test your home. If you’ve tested in the past and it has been at least 2 years, test again. Staying “in the know” with your radon levels will provide the peace of mind for you and your family. *Special thanks to the EPA and the IEMA for providing some of the radon facts above. Christopher Bice, Founder of Guardian Radon Mitigation & Electrical Services, LLC is a licensed and certified Radon Mitigation contractor through the State of Illinois’ IEMA Division.